Road disc fans were rightfully excited about Trek's recent release of the new Domane Disc. After nearly two months of testing, however, we can now say that this latest version isn't just a standard Domane with disc brakes tacked on; it's better than the original in nearly every way. If your ideal day in the saddle is several hours long across a variety of road surfaces and with lots of elevation changes, you'd have a tough time finding something better suited than this. That the Domane Disc offers better braking performance than the standard Domane comes as no surprise, especially given Trek's decision to go with Shimano's superb (and highly refined) R785 hydraulic setup. As we've experienced in the past, there's fantastic power on tap with minimal hand effort along with a positive initial bite that's far from grabby or overly abrupt. Even better, that power is exceptionally easy to control with excellent lever feel and no discernable fade even on long descents, plus the performance is unflappably consistent with rain, heat, and mud having minimal effect. We did experience a bit of noise when the rotors got hot along with a bit of lever rattle (more on that later) but otherwise, there's little to complain about. Even so, it's the ancillary changes that go along with the move to disc brakes that have us so excited about the Domane Disc – namely, the switch to thru-axles at both ends and the increased tyre clearance. 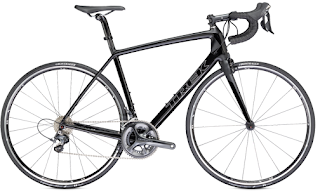 The standard Domane with its quick-release dropouts is no slouch in terms of frame stiffness – and in fact, Trek confirmed that it's nearly on par with the edgier Madone for drivetrain efficiency and actually even better in terms of front-end stiffness. Not surprisingly, then, we couldn't detect any difference in rear-end stiffness as a result of the stouter connection. We did, however, notice a slight boost in handling precision up front, particularly on bumpier surfaces such as crushed gravel and washboarded dirt roads. Moreover, the more precise fit of the thru-axles relative to open dropouts meant that we could repeatedly remove and reinstall both wheels without inducing any pad rub on the rotor. Given the company's global market and various national safety guidelines, Trek officially can only officially approve the Domane Disc worldwide for use with tyres no wider than the included 25mm Bontrager treads. However, we found ample room for 30mm-wide Challenge Strada Bianca open tubulars and their effect on the bike's ride was revelatory. As expected, the bigger tyres produced immense cornering grip along with improved drive and braking traction on looser country roads. While they of course added some weight, they also tempered the one major criticism we have on the otherwise excellent Domane platform: the disparate ride quality between the front and rear ends (and at an actual complete weight of just 7.52kg/16.58lb in stock form without pedals, it's a highly capable climber with some leeway on the scale). 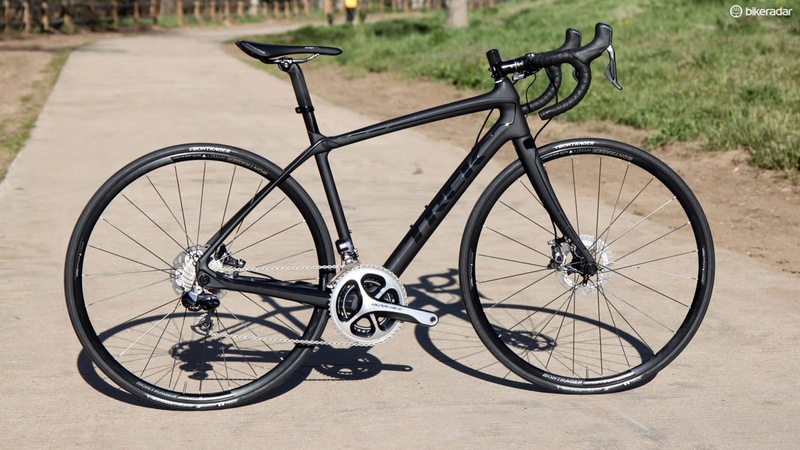 Trek's novel IsoSpeed seat cluster pivot is just as fantastic as on the standard Domane, turning standard pavement into glass and flattening even washboarded dirt roads into something that's far more tolerable. Combined with the well tuned carbon frame, the Domane Disc's rear end is exceptionally good at squelching vibration while also devouring bigger bumps – a trait no endurance bike from other companies has managed to achieve to this degree. However, the front end rides notably rougher because there's no IsoSpeed-like mechanical device up there to even things out. 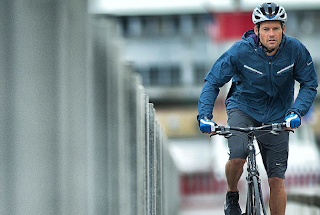 The higher-volume tyres go a long way toward accomplishing that, and it's a pity Trek doesn't include them as stock equipment. If you're careful about which wide-profile tyres you choose, the bike actually even rolls across the road faster than before, even at substantially lower inflation pressures. Otherwise, the standard Domane traits carry over, including the awesome stability at speed, surefooted cornering characteristics, and comfortable riding position. The front end can admittedly feel a bit floppy when moving more slowly, though, and tighter corners require a bit more conviction to rip through given the long wheelbase and slack angles. 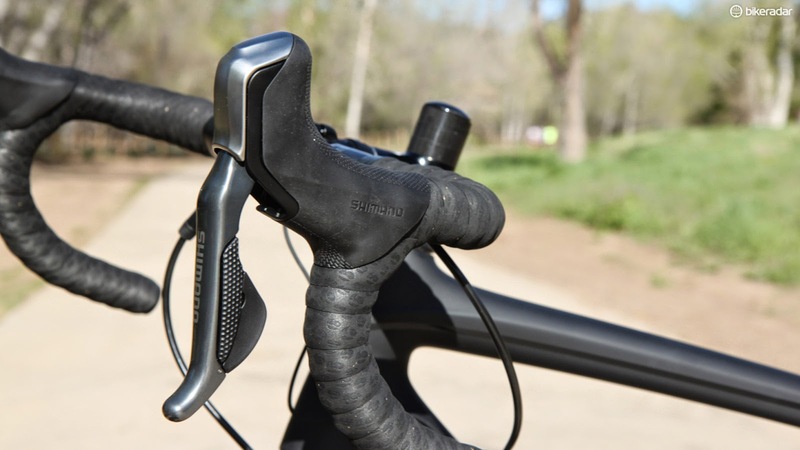 We're willing to accept those quirks in trade for the incredibly confident high-speed manners, however, and even the super-tall front end can be largely tempered by swapping to a shorter headset cover and a more aggressively angled stem. While the front triangle of the Domane Disc differs little from the standard OCLV 600-Series carbon Domane save for the altered internal cable routing setup, the rear end and fork are totally new. Trek mounts the rear brake caliper to the chainstay so the seatstays now reach further rearward to make room before arcing back down to meet the dropouts. 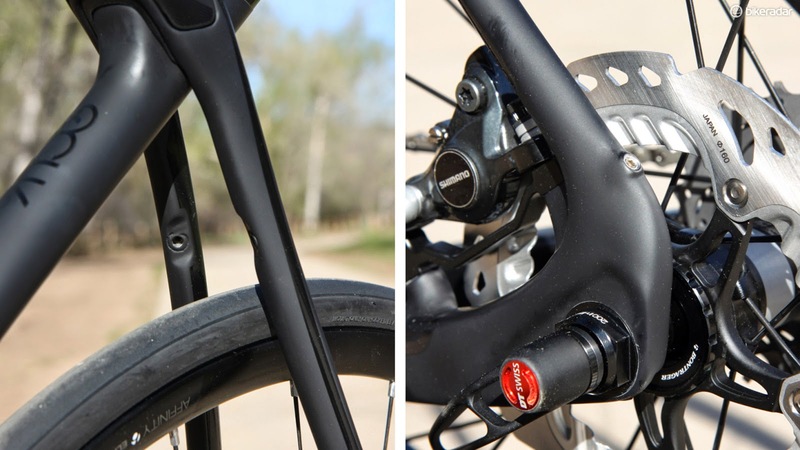 Those dropouts are also far meatier than before in order to make room for the bulkier thru-axle hardware and since there's no conventional rear brake mount required, the seatstays go bridge-free. 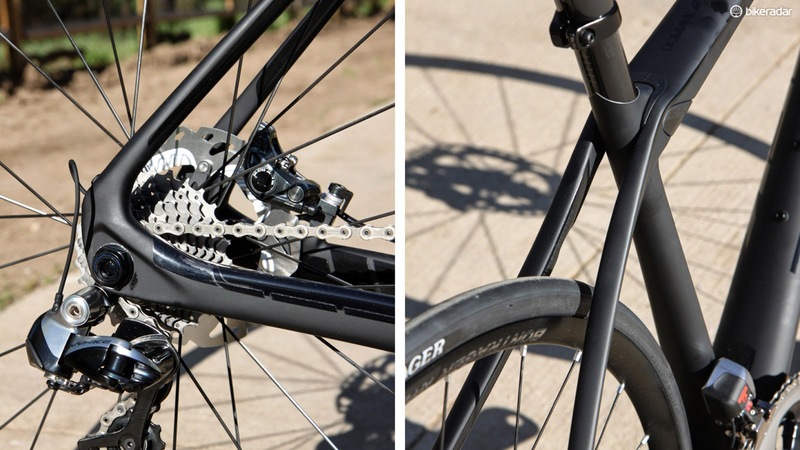 Otherwise, the standard Domane features carry over, such as the tapered 1 1/8-to-1 1/2in front end, the 90mm-wide BB90 bottom bracket shell with directly pressed-in bearings, an integrated chain catcher, keenly hidden mudguard mounts, and a pocket in the non-driveside chain stay for Bontrager's DuoTrap wireless speed and cadence sensor. 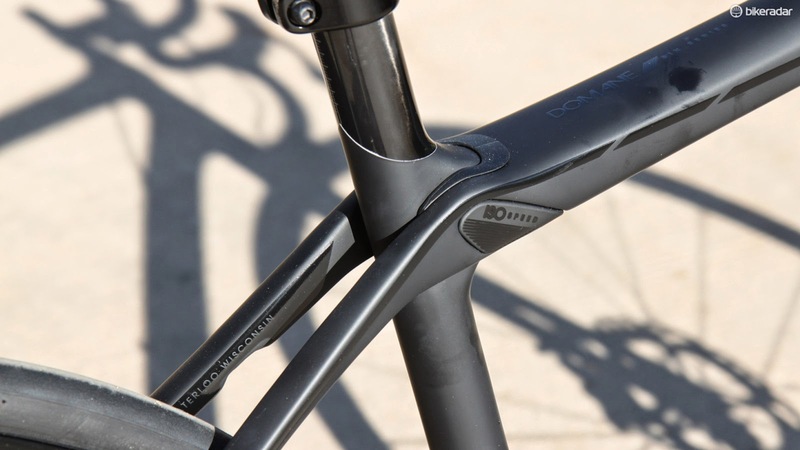 Up front, Trek retains the standard Domane's radically curved fork, which the maker claims offers more bump absorption than a more conventional setup (and we'd agree, at least to a point). 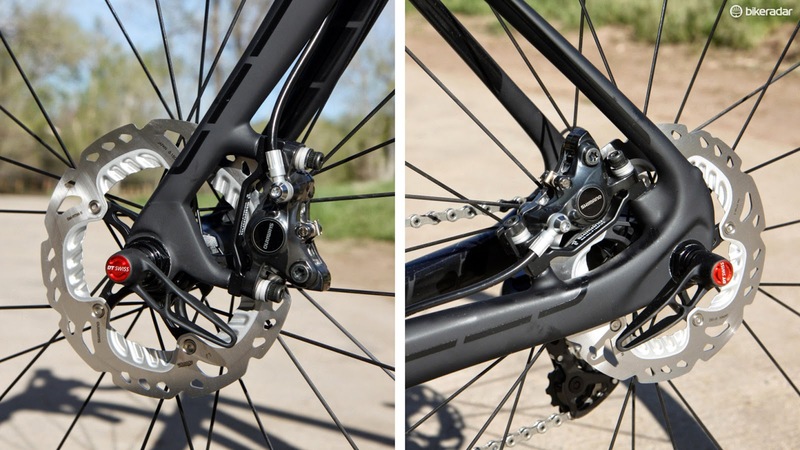 As with the frame, the dropouts are substantially bigger than on the rim brake variant in order to accommodate the bulky convertible thru-axle dropouts although some of that visual mass is concealed by the integrated post mount brake caliper tabs. Our top-end Domane Disc 6.9 model came loaded to the gills with premium equipment that included a Shimano Dura-Ace Di2 electronic transmission mated to R785 hydraulic levers and brake calipers, new Bontrager Affinity TLR Disc aluminium clincher wheels, and a variety of carbon and aluminium Bontrager finishing kit. As we've noted on previous occasions, there's little negative that can be said about the unflappable Dura-Ace Di2 transmission – push the buttons and the chain moved across the various cogs and chainrings with remarkable speed and precision, all with but the slightest wiggle of your finger. 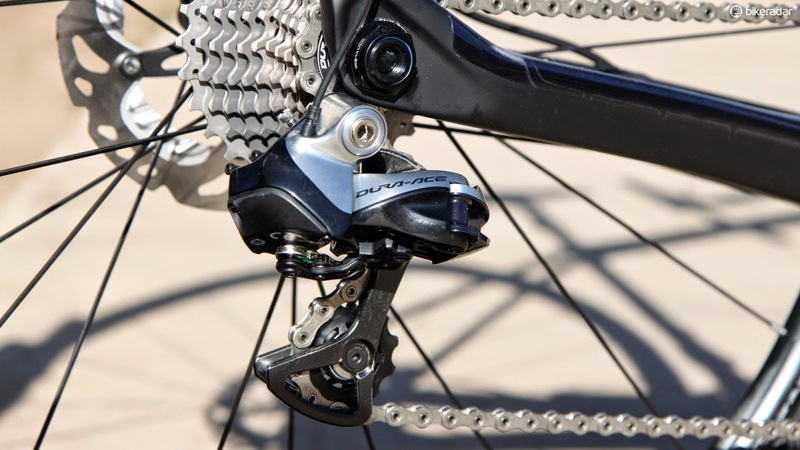 And as we've already mentioned above, the associated R785 brakes are exactly what fans would want out of a high-end hydraulic road disc system. Our complaints are fairly minor and limited to insufficient tactile feedback on the shift buttons and some persistent rattling from the levers on rough roads. We were able to eliminate most of the latter with a couple of tiny bits of thick tape applied just inside the lever body but we'd obviously prefer that Shimano iron out this bug from the factory. Otherwise, we were already quite familiar with most of the excellent Bontrager finishing kit, such as the cushy Race X Lite IsoZone carbon bar, the reliably sturdy Race X Lite forged aluminium stem, and the light-yet-comfortable Paradigm RXL saddle. 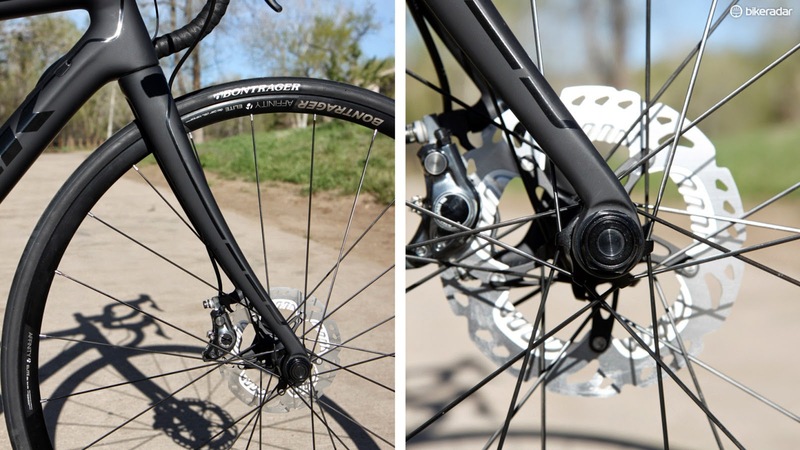 We were pleasantly surprised, however, by the Affinity Elite TLR Disc wheelset. 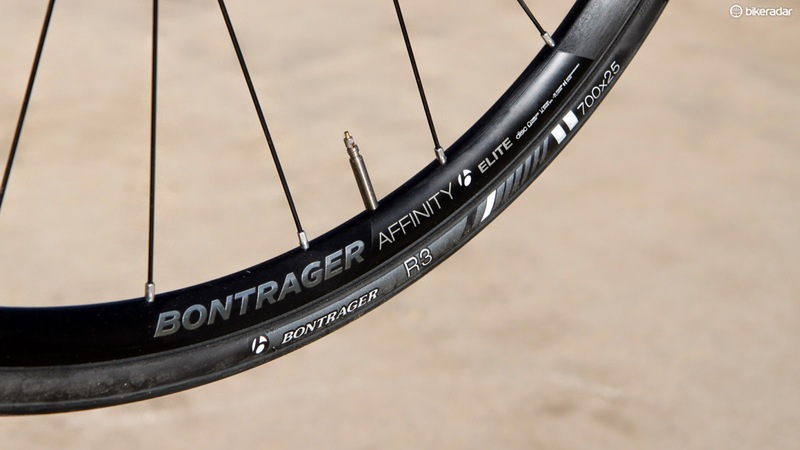 Though not especially light at just over 1,600g per set, the 17.5mm-wide (internal width) aluminium rims provide a reasonably spacious foundation for wider tyres and they've proven impressively solid with no truing required despite repeated bashing on less-than-ideal roads. Time will tell if the latest incarnation of Bontrager's house-brand hubs will hold up (the company has once again moved away from DT Swiss). Potential buyers should make note that the Domane Disc's front and rear thru-axle dimensions are shared with mountain bikes so you'll also be able to swap in many 29er wheels, too. All in all, we found the Domane Disc 6.9 to just one component away from being a wickedly capable platform for eating up long stretches of road – any road, as it turns out. We love it as is but upgrading to high-performance, higher-volume tyres makes the bike truly exceptional. Nice post. Really enjoyed reading it from first to last and I am interest for your next post and you have any time Please visit my Shock Testing page and leave comments.